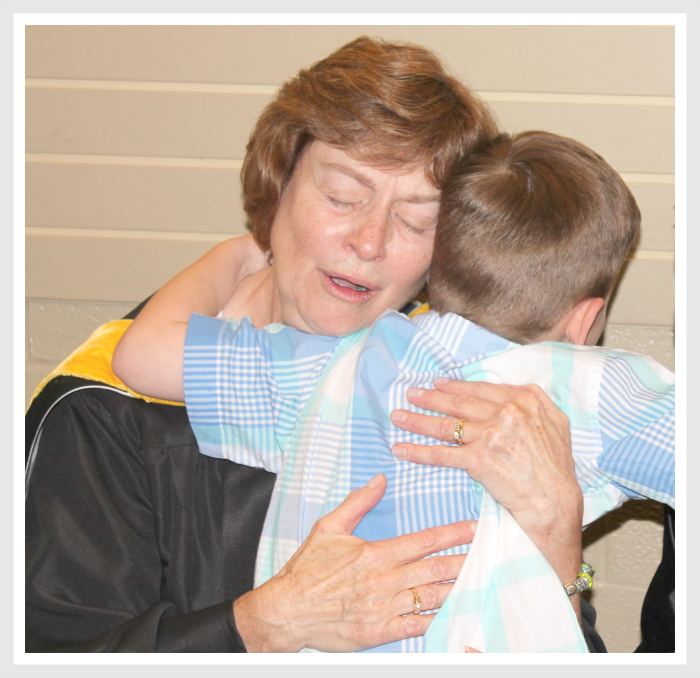 We can all look back on our school-aged years and remember that one special teacher who made an impact in our lives. For me, it was my choir & drama teacher in high school who pushed me to excel and helped me achieve things I never thought possible. He instilled in me a love for music and the arts that has stuck with me to this day. But beyond that, he taught me that our talents are gifts to be used with humility & gratefulness (a far deeper lesson that I’m truly thankful for). In the years after I graduated, he became a close friend of our family & I’m so glad that we are still in touch to this day. Now that I’m a mom and both of my kids are in school (6th grade and 2nd grade respectively), I’ve watched them experience different teachers from year to year and I’ve noticed that it’s particularly evident when they have a teacher who is organized, creative & compassionate. It’s reflected not only in their grades but also in their attitude about going to school each day and in their enthusiasm for learning. Especially for my son, who has Tourette’s, it’s so crucial to have a teacher who is willing to adapt to his needs & handle any classroom disruptions (due to his tics) with grace & understanding. One of the best parts of my job is getting the chance to work with brands who give back and I’m honored to be able to do that again today & share with you an exciting new campaign to help teachers across the US. I’ve partnered with thredUP before in the past (here & here) – not only is it a great site to shop for back-to-school clothes at up to 90% off retail, but I also love what they stand for and how they are working to make a difference. 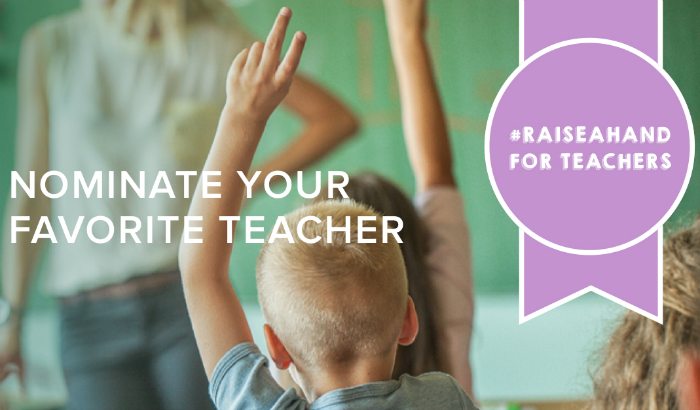 They’ve partnered with AdoptAClassroom.org to recognize and thank teachers for their hard work and the positive impact that they make in children’s lives each day. According to AdoptAClassroom.org, teachers spend an average of $500 of their own money each year to equip their classrooms and 70% of those teachers have even purchased apparel like jackets & shoes for their students. 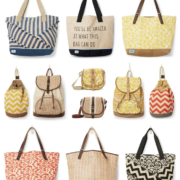 So, thredUP & AdoptAClassroom.org decided to join together to help those teachers out who are sacrificing so much of their time & hard-earned money to assist students in need. 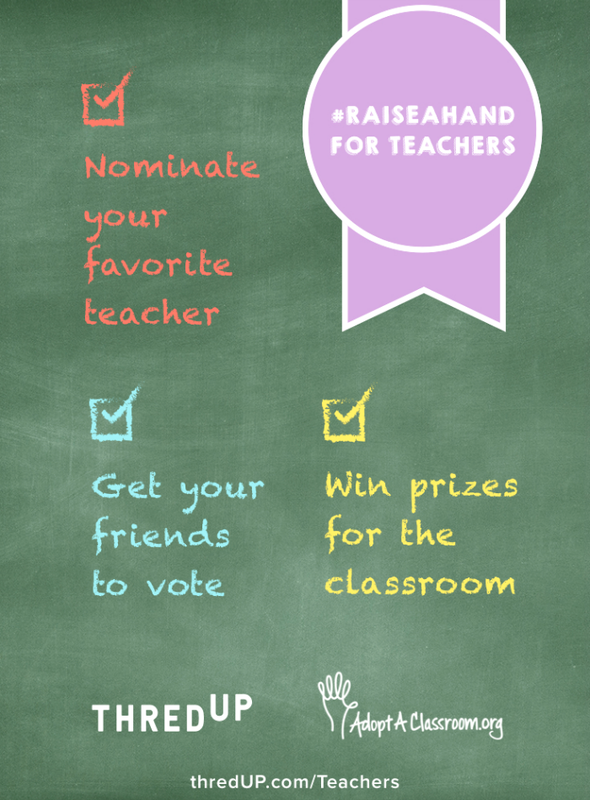 Today they are launching a campaign called Raise A Hand For Teachers. From July 15th-August 23rd, you can visit thredUP.com/Teachers to nominate your favorite teacher(s) with a photo, video or simply a great story. At the end of the nomination period, three teachers will each win $2,500 for classroom supplies and a $500 credit to shop on thredUP (plus 50 more teachers will win $100 to shop on thredUP)! This is an amazing way to say thank you to all those selfless & dedicated teachers who pour their hearts into their jobs & work so tirelessly to make a difference. I can’t wait to nominate one special teacher from my kids’ school & I hope you’ll take the time to do the same! Thank you to thredUP for kindly sponsoring this post. It is an honor to partner with a company that’s giving back & making a difference in our communities.